How do you supercharge your social media engagement on Facebook in a short period of time? Generate 35K new Facebook likes by years end. Shiny designed a monthly sweepstakes to build 21st Century’s Facebook presence. 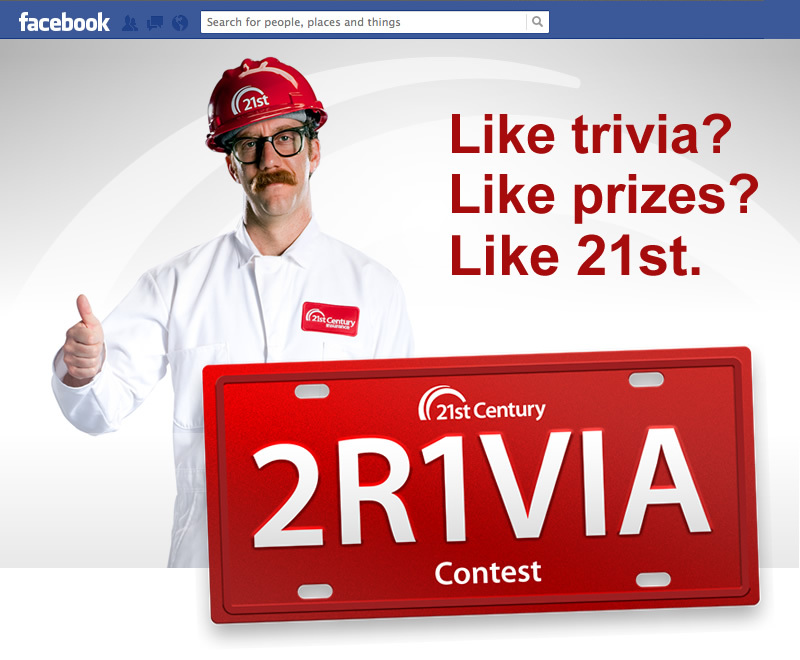 21st Century Insurance hired Shiny to better engage prospective and existing auto insurance customers on Facebook. We leveraged 21st Century’s quirky spokesperson and married it with a bold brand mark to create a fun and interactive monthly trivia contest. The results we achieved for our long-time partners at 21st Century were anything but trivial. Campaign objective was very aggressive for this short promotion. Happily we were able to deliver nearly double the company’s goal of 35K new likes. We at 21st Century Insurance consider shiny a key strategic partner for campaign execution and acquisition. While the auto insurance industry remains one of the most competitive online, shiny has executed campaigns for us that stand out from the crowd. They have helped us align our social media strategy with the company's strategic goals, grow our social presence and dramatically improved our display creative to drive results. Their attention to detail and creative mindset, makes them invaluable to us as we continue to increase efficiency in our marketing campaigns and directly impact our bottom line. Connect with us today to find out how we can enhance your social media.